The time of origin for the avocado is debated. Some claim 7000BC Central America and other 300BC Southern Mexico. Regardless, the plant started its days on the American continents. The avocado is a fruit and is actually a member of the pear family. In terms of calories, one pound of avocado usually yields around 3000 calories. They also contain loads of Vitamin B and have more potassium than a banana (relatedFAQ). When the Spanish made it to what is now Latin America, they used the avocado for many things. What I consider most odd is the fact that they used the seeds for ink. Not just any ink, but red ink that has survived to this day on documents from the time. 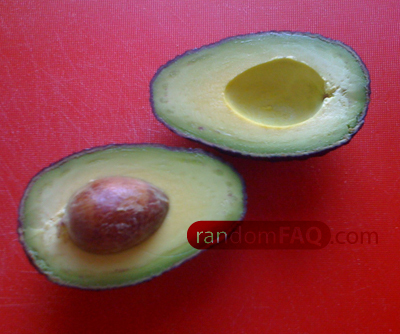 Avocado seeds contain a milky substance that turns red when left exposed to air and light. Hass Avocados were named for the Rudolph Hass. He was a mailman in the 1920s and he found that his kids really like the fruit from the tree in his yard. Since then, that variation has become most popular due to California's continued faming of the breed. Avocados clean the air at an exponential pace. Living near groves of the plant will certainly be a smart and health conscious move. Besides cleaning the environment around it and being a healthy food, the plants also filter water. The newest fad in eating avocados is to now cook in avocado oil; just as healthy and just as fattening. Sources: 1, 2, 3, & 4.